What Cyfe Triggers and Actions are Supported? Push Value - Pushes new value to Cyfe Push API widget. The first thing you’ll want to do is log in to Cyfe and configure a new Push API widget on your dashboard. 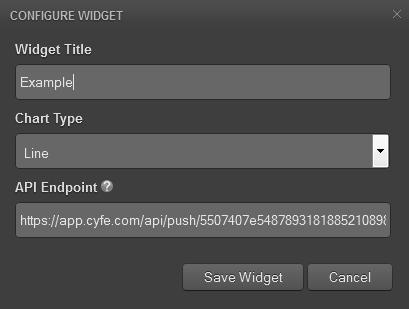 On the widget configuration screen you will find an API endpoint for that particular widget. Copy that endpoint (e.g. "https://app.cyfe.com/api/push/45ed0a904"). Then click the "Save Widget" button to activate the widget in Cyfe. Once the widget has been activated in Cyfe, log in to your Zapier account and create a new Zap. Just follow the on screen instructions to set up the Zap. During the Zap creation process you’ll be asked for a Cyfe Push API Endpoint. Simply paste the endpoint you copied earlier in to this field and continue with the rest of the on screen instructions. Once you have created the Zap, you’re all set!